Enjoy Alpine living at its best. What a lovely well maintained corner lot! Well thought out landscape. Spacious porch leading to the back yard where there are beautiful shade trees. Perfect for those lazy summer afternoons, enjoying BBQ with family and friends. Open floor plan with two full bathrooms. One of the two bedrooms is the perfect setting for a personal office. All appliances come with this home. Call today to see this home, it will sell fast! 2001 Manufactured Home with desirable split floor plan. Bedrooms at each end of the home for privacy, large fenced yard for your kids to play in. Mature avocado & tangelo trees plus other beautiful plants and trees. Enclosed porch to enjoy your morning coffee or dining "outdoors". Large 120sf storage building, central air and concrete sidewalks. Oversized master bedroom will accommodate a CA King bedroom set with room to spare. Master suite offers a walk-in closet plus a private bathroom. 2nd bedroom has double doors to allow access for a wheelchair. Third bedroom is conveniently located next to guest bathroom. Large living and dining areas. Kitchen features a large pantry, side by side refrigerator, stove & dishwasher. Indoor laundry room with hookups and space for an upright freezer. Don't miss this home, it will sell fast! BEAUTIFUL HOME IN A VERY PEACEFUL SETTING. Located right off E Main Street in El Cajon, remodeled home in a corner lot with a large fenced yard is a move in ready! New floors, kitchen cabinets with granite counter tops, bathroom cabinets and new appliances. Space rent is only $780.00. More pictures are coming soon! Clean, bright and cheery. A great value for the price! This quaint home is located on a corner lot, great for privacy and open space. A great back yard with room to grow a small garden and lots of room for plants. A bright, cheery kitchen with lots of storage and a great pantry. Nice carpet throughout this home. The dining room features a built-in hutch for lots of storage, and a ceiling fan. The enclosed porch has a separate entrance and lots of windows with great lighting. can be used for an office/hobby room or extra storage. Master and guest bedrooms both have built-in drawers for space saving. Small 1/2 bath off the master bedroom. All appliances are included with this home. This is a very desirable senior community with a beautiful clubhouse and swimming pool. A great buy for the price ! Gorgeous 1440sf home on a large corner lot! Dual pane windows, recapped roof & tankless water heater are a few of the great updates this home features. Walk ramp, large storage unit with two doors. Desirable split floor plan with bedrooms at opposite ends of the home. Home is light and bright, beautiful kitchen with breakfast nook, white cabinetry and all appliances included. Dining area has a beautiful built-in hutch, large living room as well. Master suite features a large walk-in closet and a private bathroom with a large walk-in shower. Spacious bedrooms and a guest bathroom with a walk-in, sit down tub. Low maintenance yard. Indoor laundry room with washer and dryer included. Lovely home in need of a new owner! Call to see today. CORNER LOT - RAMP TO BACK DOOR. This home is beautiful and very well taken care of. Own the land and the mobile home in this beautiful gated senior community. HOA is $75 a month. Spacious bedrooms and baths. Enclosed porch, nice kitchen cabinetry, newer carpet. Side by side refrigerator, stove, dishwasher, washer & dryer included. Very private, large backyard is perfect for a BBQ. This is the home you have been waiting for! Beautiful manufactured home with split floor plan featuring bedrooms at each end of the home. Beautiful kitchen with breakfast bar, updated appliances, pantry and ample counter/cabinet space. Formal dining area with beautiful chandelier. Spacious living room features a dormer window. Master suite offers a walk-in closet and a private bathroom. Spacious 2nd & 3rd bedrooms plus beautiful guest bathroom. Indoor laundry room with washer & dryer included and overhead storage cabinet. Fenced yard ready for your children & your pet. Don't miss this home as it will not last! Nicely laid out floor plan. Cozy kitchen with plenty of cabinets. Dining room features a beautiful built-in hutch to display your china. Living room and dining room have large dual pane windows to light up your home with sunshine. Master bathroom has an extra dressing room along with a walk-in shower. Master bedroom has a sliding glass door leading to a small porch in the back yard where you will find an orange tree along with a 6.5' X 14' shed with built-in shelving! This home also features a large side porch where you can relax and enjoy the soft spring breezes. Sip some iced tea and enjoy the views from this beautiful well maintained senior community. This home is so beautiful and well cared for! Back bedroom has room for a desk, mirrored closet doors and built-in cabinetry. Master suite has a half bath, a retreat with access to the large yard and mirrored closet doors. This home was well designed with an eat-in kitchen. Ample counter space, pantry and beautiful flooring. Expanded living room with sliding glass doors that lead you into the front deck, where yo can enjoy your morning coffee. Main bathroom has a walk- in shower and washer/dryer hookups. Low maintenance yard with rockscape. Excellent condition throughout. Space rent includes water, trash and sewer. Come see for yourself! Beautiful home in the most desirable senior community in Southbay. Own the land and HOA fee is only $75 a month. Gated 55+ Community close to shops and restaurants. Spacious home with large lot, 2 decks and storage sheds. Beautiful kitchen, large bedrooms and baths. Bonus room is very large and has access to both decks. MLS 160008090. 1440sf 2005 Manufactured Home. Fantastic location with large lot. Very spacious kitchen with breakfast bar, refrigerator, dishwasher. Indoor laundry room with washer & dryer included. Living room features a big space for a nice living room set. Floor plan with 2 Guest bedrooms next to each other and a spacious guest bathroom. Master bedroom with private bath. Large master bath offers nice big sink, a tub/shower combo. The home was in the process of some remodeling so there is few work to do, finish and build equity right away. This a very nice all age community in the heart of Chula Vista, that offers a big clubhouse, game room, very nice swimming pool and hot tub in addition to the children's play areas. Close to everything, shopping, dining, city library, transportation, etc., all within walking distance. Call Today! This beautiful home is a must see, you will fall in love with it. Happy Living starts here!! This 2005 Fleetwood Festival home is better than a brand new. In spite of the recent manufactured year, this home has been completely remodeled, elegance and luxury all throughout, granite counters in kitchen, copper sink, brand new stainless steel appliances all included; both guest and master bathrooms with brand new solid wood vanities with granite counter tops. Brand new washer and dryer also included in addition to the brand new high quality carpet. It includes a factory built integrated front porch. Fantastic floor plan with a den that features a brand new fireplace for those cold nights. Central air for hot days and a low maintenance yard. Fantastic corner lot location in this breathtaking and peaceful gated senior community. This home will go fast! Beautiful home in a fantastic all age community! Large corner lot with grapefruit, orange and lemon trees. Gorgeous kitchen with white cabinetry and all appliances included. Inviting living room with sliding glass doors. Dining area offers a beautiful built-in sideboard. Large bedrooms, walk-in closets and full size walk-in tiled shower stall. This home has been well cared for. 2012 water heater, newer furnace and flooring in living areas. This community offers a swimming pool and a clubhouse. Near stores and restaurants including Viejas Outlet Center & Casino. Space rent is only $655 for this fabulous home! Featuring vaulted ceilings, creating an open spacious concept. Your beautiful kitchen features a large bay window to sit and enjoy your morning with a nice cup of coffee. The dining area and living room have beautiful laminate floors. The living room is large and has a great dormer window allowing for nice lighting, also adding some nice character to this home. A well designed floor plan with three bedrooms and two full baths. Large master suite offers a private bath with a garden tub and a great linen closet. All appliances are included and ceiling fans throughout. Central air conditioning. A large patio deck for outdoor entertaining. Enjoy living in this beautiful senior community, home is located close to the clubhouse and swimming pool. This home has so much to offer! What a fantastic deal in this beautiful senior community! This home sits on a corner lot and features 2 large fruit trees. Spacious kitchen with all appliances included. Dining are has a beautiful built-in hutch. Large living room, master bedroom offers a private bath. Large carport and covered patio area. Exquisite newer 2006 home in pristine condition. Very well designed floor plan with 3 bedrooms. Gourmet kitchen includes all appliances, counter/cabinet galore and a beautiful breakfast bar with beautiful counter tops. The dining area features a beautiful dormer window. The front porch invites you into this gorgeous home! Large living room with dormer windows and window A/C for those warm days. Master bedroom features a private bath with deep tub plus separate shower stall. Yard for your children and/or pet. You don't want to miss this home! It will sell fast, call today! This home is priced to sell fast! Live in Alpine's fantastic senior community. Master suite features a walk-in closet along with a dressing room. Bedrooms are very spacious with plenty of storage throughout the home. Large dining and living rooms. Perfect for entertaining family or friends.Large family room for movie night with friends!All appliances come with the home, along with a newer furnace. This gorgeous senior community is near great shopping & dinning spots. (619) 666-4672. Lily Pigg - Realtor presents this beautiful home. This home is in excellent condition! Laminate wood floors throughout. Interior was recently painted. Kitchen includes all appliances. Large backyard plus deck. Own the land as well as the mobile home. Gated community close to all. $75 HOA, inexpensive living in San Diego County! MLS #150046033. Rock Solid Real Estate Co. BRE Lic #01927451. Gorgeous home with several upgrades. Beautiful open kitchen with stainless steel appliances included, washer & dryer are included as well. Dining area has a beautiful built-in hutch. Laminate wood floors throughout the home. Spacious master bedroom features a private bathroom with shower combo. Guest bedroom and spacious guest bathroom with shower combo as well. Step out into your backyard, feels like paradise. Reasonable sized yard with storage shed. Don't miss this home, homes in this community sell fast! 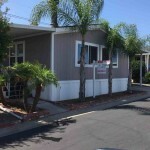 This well maintained all age community is the envy of South San Diego. Superb Management and resort like club-house. Enjoy a dip in the swimming pool on those hot days, play a billiards game or read a book in the club- house. Call Shannon (619) 855-7210 to view this home. Fantastic manufactured home with a split floor plan. Several upgrades including separate laundry room with a lot of storage space and wood laminate floor. Kitchen features laminate floors as well, breakfast bar and includes all appliances. Large living and dining rooms with nice dual pane windows. Beautifully upgraded master and guest bathrooms with walk-in showers. Large lot with low maintenance yard, nicely designed rocks, stone benches along the walkways below the deck. This home is lite & bright and ready for a new owner. What a fantastic deal in this all age gated community! Enjoy the view and feel the breeze, downtown San Diego is about 6 miles away. This home sits on a corner lot high above the rest. Enjoy your family BBQs in the great patio area & your morning coffee on your private deck. Spacious living room, formal dining area and a kitchen with beautiful cabinetry and counter tops. Appliances are included. Indoor laundry space with washer & dryer included. Master bedroom features a private bathroom. Guest bedroom and bathroom, storage sheds, security door. This home won't last, call to see today! EXQUISITE & MOVE IN READY! This stunning home was tastefully remodeled with high grade laminate flooring all through- out. Recent upgrades include master & guest bedrooms with top quality carpet, all interior paint with nice pastel colors, outside brand new paint. Beautiful kitchen featuring a pantry, breakfast bar plus all appliances included. Fantastic open floor plan with with beautiful touches. Large living and dining areas with a fire place for those cold nights. Master bedroom with private bathroom and a walk in closet, indoor laundry room with washer & dryer included. Gorgeous fenced side patio to enjoy an outdoor BBQ with friends and family. This is a great deal on an immaculate inside and out home. Corner lot nestled in McManus Valley View Mobile Estates, Near Hwy 52 & 125. Financing available OAC. Rare opportunity in this beautiful all age community. Very spacious home with great floor plan! This home needs to be updated with carpet, paint and a few other upgrades. Large living room, formal dining area with built-in hutch. Decorative fireplace, large kitchen with white cabinetry, all appliances included. Indoor laundry room with washer & dryer included. Large master suite features a walk-in closet and a private bath with walk-in shower. Deck, fenced yard with views plus storage sheds. Very spacious home with a great floor plan. Kitchen has lots of counter space and plenty of storage. Large living and family rooms give a nice flow to this home. Master bedroom features two closets and a private bathroom. Central air conditioner, indoor laundry room with washer and dryer included. Low maintenance yard. This senior community offers a beautiful swimming pool and a hot tub! Come enjoy living in this lovely senior community with a great club house, many activities to enjoy! Luxurious 2006 SCHULT 1740sf manufactured home with top of the line upgrades! Fantastic floor plan gives it a "house feel". Gourmet kitchen features top of the line 4 door-French Door refrigerator, microwave over the stove, pantry and an island for added counter space. Beautiful dining area with built-in sideboard and cabinetry. Inviting living room with a beautiful fireplace. Desirable split floor plan with bedrooms at opposite ends of the home. Master suite offers a private bath with a large garden tub, linen closet plus a separate shower stall; in addition, there is a large walk- in closet wit built-in shelves. Indoor laundry room with top of the line cherry-red LG front load washer & dryer. Spacious bedrooms and guest bath featuring a tub with glass shower doors and a linen closet. Beautiful front porch entry, features TREX decking and stairs. Covered porch to enjoy your morning coffee! $655 Space rent includes water, tash & sewer. Similar homes in this community sell for about $60,000 when in good condition. This is a fixer upper but worth fixing it up! Nice kitchen with all appliances included. Large living room, spacious dining room plus a bonus/family room. Good size bedrooms & baths. Indoor laundry room with washer & dryer included. This home sits on a large corner lot! Feel the breeze and enjoy country-like setting. Kitchen includes all appliances, dining are has a built-in hutch. Large living room with access to the deck. Indoor laundry room with washer & dryer included. Master bedroom offers a large closet and a private bath with a walk-in shower. Second bedroom offers a walk-in closet, guest bathroom with bathtub. Deck, storage shed, large lot. Home needs new carpet & paint! Fantastic 1999 manufactured home in an all age community! Great 3 Bedroom, 2 Bath floor plan with drywall throughout & cathedral ceilings. Very spacious bedrooms, large living & dining areas plus 3 skylights. Beautiful kitchen includes all appliances, trash compactor & an electric wine cooler, walk-in pantry and breakfast bar. Desirable corner lot with room for entertaining. Fantastic master suite with walk-in closet plus private bath that features a skylight. Spacious 2nd & 3rd bedroom plus beautiful guest bathroom. Homes in this fantastic community sell fast, call to see today! Space rent $775. FANTASTIC DEAL! CORNER LOT IN BEAUTIFUL COMMUNITY.